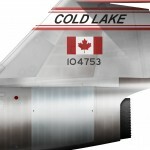 The 104753 served with the Canadian 417 Squadron, based in Cold Lake, Canada. 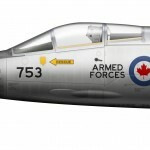 The 417 was originally a RCAF squadron formed in England in 1941 and fought in North Africa and Italy. In 1948 it was disbanded only to be reformed 22 years later in 1970 from the No. 6 Operational Training Unit at CFB Cold Lake. There it would train CF-104 pilots until the Starfighter phased out in 1983. Nowadays the 417 serves as a Combat Support Squadron flying helicopters like the CH-146 Griffon in a SAR role. This particular CF-104 can be found at the Air Force Heritage Park outside CFB Winnipeg.